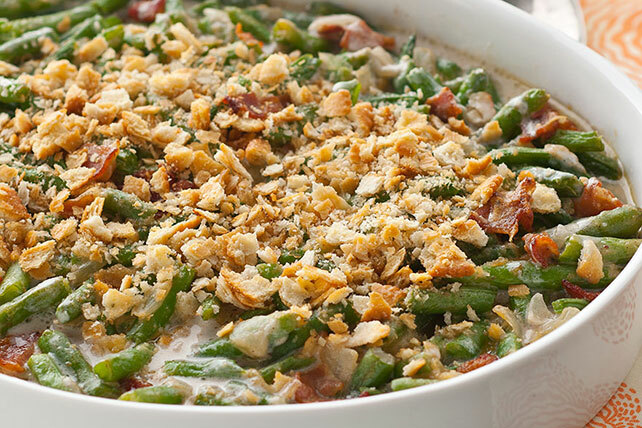 Mix in savory bacon, cheesy sauce and crushed crackers to make our Smoky Fresh Green Bean Casserole. Ordinary fresh green bean casseroles: watch out. You've got nothing on this smokier version! CHINET® and CHINET BAKEWARE® are registered trademarks of Hutamaki, Inc. in the U.S. and other countries. Serve this irresistible vegetable side dish along with your favorite lean meat at your next get-together. Assemble recipe as directed. Refrigerate up to 12 hours. When ready to serve, bake at 350°F for 45 min. or until heated through.